Project Backup is small but now big goal of mine to backup my life. From all my files, photos, articles, documents and memories everything can be accessed safely and securely from my finger tips. But why? So from the days of school I when through a theft of my iMac and this had years of photos videos and other valuable files on it and within a flash it was gone. The term don’t carry all your eggs in one basket springs to mind. So the move to collecting bits of information started off from a Diggnation episode with Kevin Rose (founder of Digg.com) talking about a cool app that you can save notes of different things. The example he gave was taking photo of a wine he liked in a restaurant then keeping it for later. This was a simple concept and at the time more of a over sight what if this note could be saved for a longer time lets say over 5 years. A little later I tried out Onedrive that was a place where I would drop off photos. The problem with this service it was slow and uploading would be like watching paint dry. I’m sure its fine now though. After this I used the like of Google Docs (Now Google Drive) back up my work for GCSEs (middle school) to make sure I had it somewhere else but my laptop. But it lacked ease of use at the time with file support. However next was Dropbox this is what I currently use. After using Dropbox for about a year backing up my A-level and University work. In my second year I started looking at ways of collecting resources to help with studies and I stumbled across this brilliant video and article By Thomas Houston @thomashouston at The Verge all about using Evernote to save everything read, wrote or researched in one system that could be searched easily later. Really work a watch. This opened up the idea of keeping everything in a place where I can access what I noted or uploaded, when I need it. This was great during University being super organised (I would like to say it helped me get first class honours, but i can’t say for sure!) But in my last year I started to working for different companies, traveling more, meeting an array of people and I was in constant need of a system again. This lead me to Project backup. Evernote is my central hub for information, it’s easy to use just add notes to notebooks and add relevant tags then it all syncs up to the cloud. As it’s full of notes and information it had to be organised as you can see from the picture below. I used the 001_NAME system used in Thomas’s video. I tend to make sure the stacks I use most are at the top for ease of access. Under there stacks will have relative topics as notebooks. When it comes to naming system is the ‘to do’ system this will be to watch, to read, to download, these are my action tags. If it’s done I add ‘to done’ then delete the old tag. When it comes to naming I will make I can easily search for it later, adding comments help. For some of the meeting or training notes where dates are involved I add the date in front. DD/MM/YYYY. But for finding notes I’ll use notebooks as I find them easier. 001_Mindshare – 001_ wil always be my current place of employment. 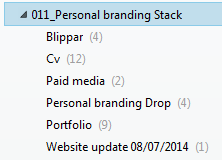 If I do move I will combine this stack into one notebook called ‘Mindshare’ then move it into 022_Work as a archive. I tend never to delete it only if I know my future me won’t want it. 003_reading stack is everything I have read and want to keep, if I want to read/watch it I place it within notebooks like ‘Q Books’ or ‘Q Movies’ To add notes like Articles I use the Evernote Web Clipper for Chrome which as seen below can clip from the web. The different clips from Article, full page to screenshot makes it really handy to capture just what i want. ‘Simplified article’ is really good for mobile for reading. The clipper is great as it lets you set the notebook and tags right then and there. 004_Personal is a big stack with all different notebooks, the main ones are ‘Faimly – Parents’ shared with them for general bits like shopping reminders or a places to go for a meal, coupons.. Family (Personal) is just for me, usually for Christmas and birthdays. ‘Receipts’, ‘Qualifications and Certifications’, ‘Accounting ’ notes/docs are all scanned with my Hand held Scanner Doxie Go that can scan anything just over A4 with as seen below using a picture. 005_img is a dumping ground for all things photo that I will clip from the internet as mentioned before with Web clipper. Evernote also working with Gifs quite will, so there will also be a time when a gif explains myself better with friends. 007_Handy is a drop of all different things I would think I would want in the future like handy software, ‘Events’ and ‘Webinar’ that I may want to go to or watch. If I have missed an event I will set a reminder for the next work a month before to get tickets for it. This has proved to be very handy to make time for the event. I love advertising and communications so i tend to save the campaigns I like,its good for inspiration but the good ones tend to go onto my Pinterest board ‘Ads and content’ ‘Tool’ is very handy as this is where I keep all my bookmark worthy kind of websites. 008_Social I shall do last as its the biggest to explain but worth checking out. 009_Travel has individual trips as notebooks, this includes tickets, hotel invoices and any cool things I find while on holiday. So if I ever go back or someone I know is planning on going I can share this notebook to them. 010_personal branding is a all the things like my cv, some design work, written backup of my work and experience but also answers to recruitment when applying for a job application. So it is all there when I need it for a quick turn around. 011_app development is a shared notebook with a friend, we structure that stack with each app having its own notebook. This works well as it is a good way of sharing code, some graphics and concepts for development. 015_Design is new, this where textures templates bits and bobs that are not suitable for 005_img. A thing to note I tag what platform I would like to use it on. 016_Email Subs will be covered in the next section. 020_Archives is any old notebooks or stack that I don’t intend on using again. 021_Bucks New Uni is to large I believe to condense into one notebook, So in the end I just moved it down by making the number larger. The rest are either old or I just haven’t sorted them out yet. This is when it really gets interesting IFTTT. So for the last 6 months I found a way of being able to save more then just articles and documents, I wanted to save everything from favorited tweets, Facebook status updates, liked Flickr photos, reddit up votes… it keeps going. And then it all goes to my Evernote. 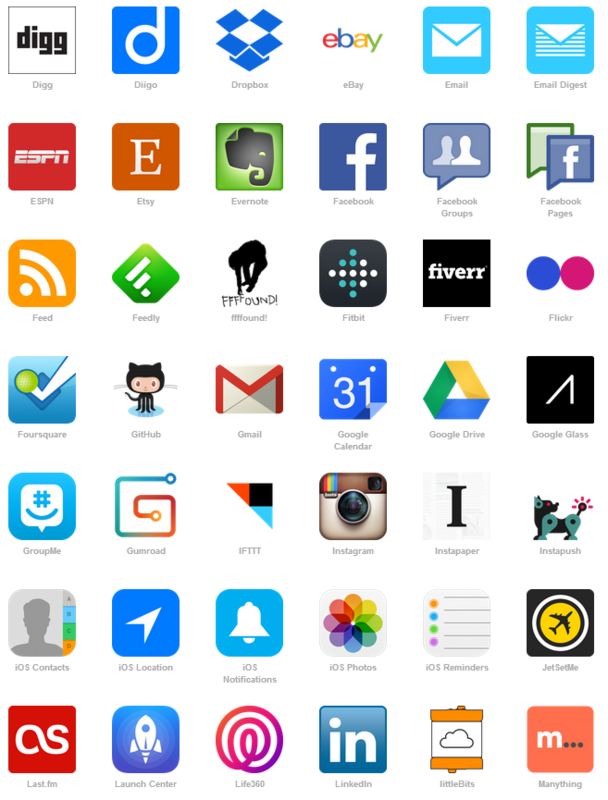 I use a service called IFTTT (If This Then That) Its basic but can be very powerful. How it works is that its based off triggers, if a one thing happens then it will make another thing happen. The service works with 119 different channels and still growing some examples can be seen below. As I have a wide range of recipes running I will go over my top 5. Most of the below recipes are highly customizable and can be used the same with other channels. Also with the below they all have the tag IFTTT so I know they are from the service. 5 – If I update my Facebook status it will save as a new note on evernote. Many of the above are really handy, because if you read something or liked a photo you can go back quick and find it. Saves going through a range of sites sites thinking where the hell is it? But recently a step further with email subscriptions using the Evernote email. I tend to get a lot of emails a day from different advertising/media/tech blogs and websites as I want to keep them, so I can search for a brand later on if I need research. I have found two ways of doing this. But I have now setup a way of using a IFTTT recipes that automatically ads a email with a label to individual notebooks. The way this is done, I have setup a filter when an email from a curtain address comes in it adds a label automatically, in this case ’10before10′. But then with IFTTT I have setup a receipt if a Gmail has that lable it then gets moved to a notebook in evernote. See which system works for you, it’s a little pain to setup but when it’s done it’s done. So Evernote isn’t good for everything currently it has a limit on its upload 1GB each month so at the end of the year you can have 12GB and it keeps going very nice. However its not to good when editing more complex documents. A good example of this is photos, I have over 9000 photos and videos. So I use Dropbox with a pro account that has 100gb of data. I use this for my big files like my Design work full of large pictures and graphics. My structure tends to follow the same as Evernote becuase if its not in my Evernote it will probably be in my Dropbox. Back to my photos, my system of keeping them organized is with Adobe Lightroom l (I have gone for the umbrella package of all the software Adobe CC), this won’t be a suitable for all as it has a monthly cost. But there is no reason why you can’t use iPhoto or a windows program. 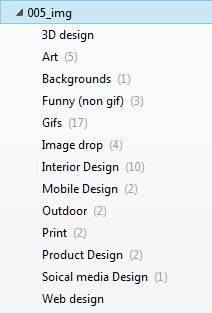 What happens is when I import photos the program then adds the photos to a directory that is placed within my Dropbox. Also if you use the above system or just have your photos in Dropbox you can use a app called Carosel by Dropbox. It displays all these photos and videos in a full timeline from your earliest photos to the oldest as seen below. Passwords, birth certificates, National insurance number… This had to go into another system because I don’t to say it again, all my eggs in one basket. It syncs to Dropbox as a backup but even if a hacker gets hold of the data it would be hard to hack as it has layers of encryption. The good thing about this software it can safety accessed from mobile making it very handy for accessing important information quickly and safely. Also the service helps to input password in web browsers for example with the chrome extension. Really really handy when you have a range of account with multiple passwords. Just me but it’s the only service I won’t open on other peoples devices as it’s easy for someone to have a key logger. But it’s a good program for keeping these 100s of password, confidential documents and genral notes that you want to keep under wraps. The end all backup done.. well maybe. Overall the above system works for me, it’s not perfect but it seems to be working. 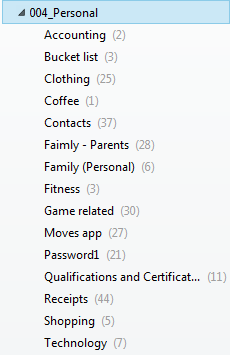 To be able to access everything saved in a year 3-5-10 years times is going to be handy, from bills to receipts. Even if my house burns down to ashes most things important will be backed up in one for or another (including recipes of things I would have to claim). On the point of backup, month on month I will backup and export the whole of my Evernote to XML format just incae it all goes wrong. Even then my laptop itself has a backup on an external drive. I may look for a complete cloud backup of my laptop but cost is an issue, but at stage i might be going crazy with paranoia. But jokes aside I feel safe with my setup, My iPhone broke last week and I didnt worry everything was either in the cloud already, so when I get my next phone (Nexus 5, might be a review coming) it will only be a case of signing in with Evernote, Dropbox, IFTTT..
My advice is find what works for you, taking into account what data you use and what you will want in the future, then find the service you find mose suitable. It has to be easy, customisable, compatible, non-costly with different file formats and also work on multi devices.